Learn how to tie fishing knots! The most popular fishing knots explained in detail with pictures each step of the way. Learning to properly tie the best knot is critical if you want to become a better fisherman and not have that once in a lifetime fish become a tall tale. 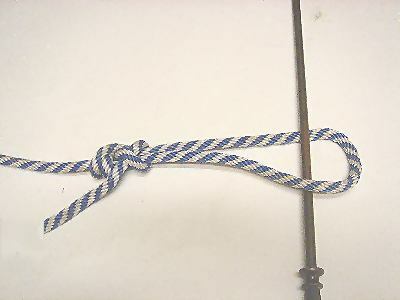 Need to learn how to tie a specific knot or need to find a fishing knot for a specific purpose but don't know which knot is best for that purpose? You should be able to find you answer here. I don't have every knot listed as many are redundant. If you know a hitch or knot that I don't have listed that you think will serve a purpose better than what I have listed then email me and let me know. And knots aren't just reserved for fishing line. 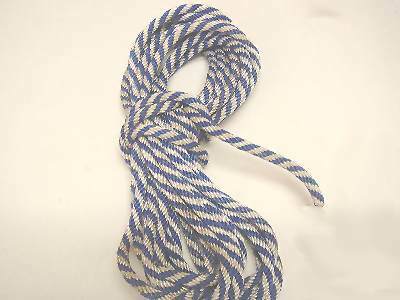 Fishing often envolves boats and there are a whole host of knots that will come in handy whether you are mooring a boat or tieing on an anchor. Can't find the knot you were looking for? Let me know which knot and I will added it!!! Contact me! This uni-knot is one of the best knots around withstanding sudden jerks better than other knots. Very strong and can be used in a number of applications although it is most commonly used for tying fishing line to terminal tackle. The uni-knot works with both braided lines as well as monofilament fishing lines. 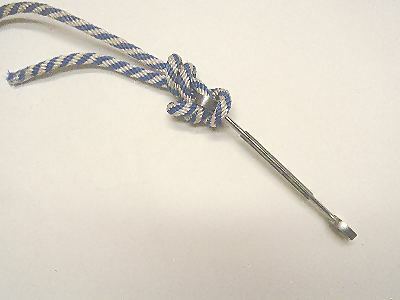 The knot can be tied directly to the hooks eye in the traditional manner or the knot can be tied as a loop. Instead of sliding the knot all the way to the eye simply slide it to the size loop desired. Then, gripping the loop just forward of the hook eye and pull firmly on the tag end when the loop is at the desired size. This locks the uni-knot around the standing line. This a a version of the uni-knot that is snelled. This puts the knot below the eye of the hook where it is protected from abrasion. The angle of pull on the hook is also slightly different than a regular non-snelled hook with is slightly better for setting the hook. Now that you know the Uni-Knot it is a simple matter of adapting it to join two lines together. 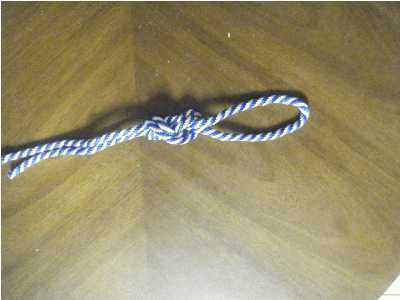 Now you no longer need to know a seperate knot for this. No need for a fishing knot and another for joining two seperate line. 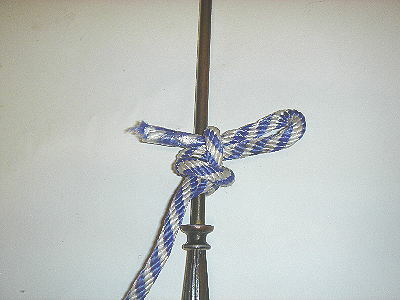 The Stren Knot is an excellent knot for joining braid to a mono leader. 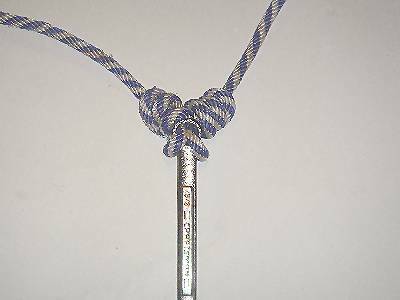 The Clove Hitch is a quick and easy way of tying a line temporarily to a piling or post. It will usually not bind and unless the pole can turn will usually not unroll once it has been pulled tight. It can be worked lose by repeatedly working the tag line back and forth varying the angle. You can add one or two half hitches on the standing line for a more secure hitch. With the half hitches this is a excellent way to tie up to a dock without the line binding over time. The Alpine Butterfly is one way of putting a loop in the middle of your rope. The rope still runs straight. It is also easy to adjust and to untie. And most importantly is easier to untie, after being weighted, than a figure eight. Not to say that it can't jam though. 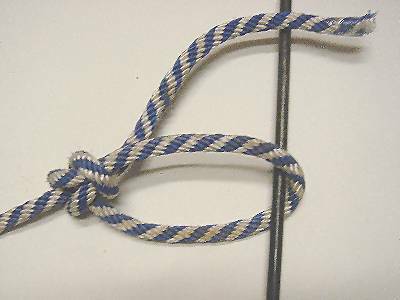 The Bowline Knot, which forms a loop, is one of the most important knots to know especially for boat owners. 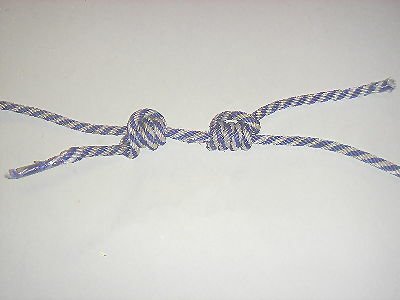 The bowline knot is the prefered knot whenever a line is expected to be under a load. Give it periodic slack and the bowline knot is not secure enough. This can be remedied by leaving a long tag line and tying a stopper knot. But to reimphasis... the reason this knot is so widely known and used is because it will almost never jam. 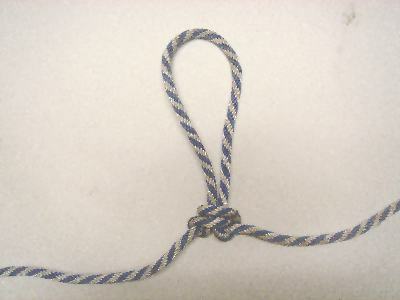 The Palomar Knot is used to tie fishing line to a hook or lure. The Palomar Knot is one of the strongest, if not THE strongest fishing knot know. It is a really easy knot to learn and tie. Advantages are easy of learning and knot strength. Disadvantages is that it is difficult to tie to tackle that is very large such as snapper rigs or any object not free for the loop to go around or if you have a large diameter line that won't fit through the eye of the hook twice. 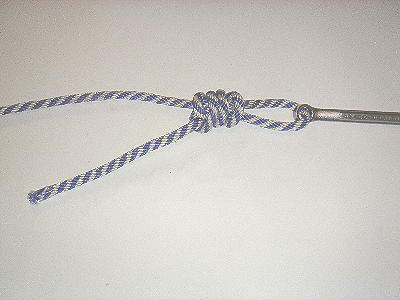 The Improved Clinch Knot is probably the most widely used fishing knot today. 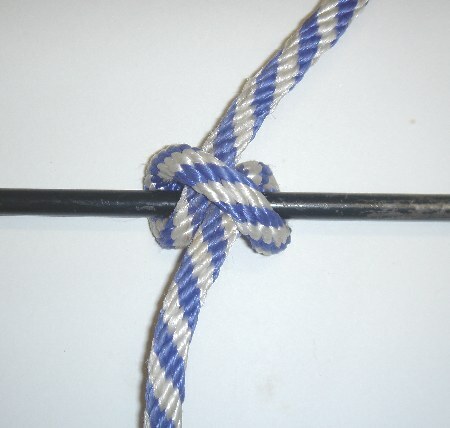 The Improved Clinch Knot are very strong and don't slip. This is an excellent knot most lures and other terminal tackle. Hint instead of wrapping the tag line around the main line it is usually easier and quicker to simply grasp the tag and main line and spin the hook or lure to get the desired number of twist. The Highwayman's Hitch is the perfect knot... I mean hitch for tying a rope to an pole when you need a quick release. To untie you simply pull on the tag end and the rope will be completely free of the pole it was tied to. The quick release is what makes it famous but it also gets the thumbs up in its ability to not jam after being loaded. To make the hitch more secure the tag end is often left long and dropped through the center of the loop. 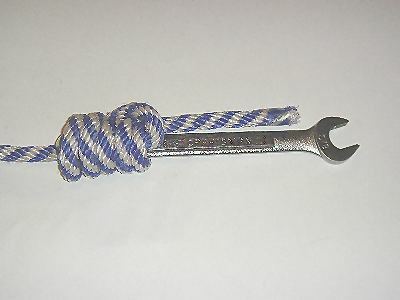 The Offshore swivel knot is used to attach a swivel or even a hook to a main line. Commonly used to provide a place to attach a hook or sinker off of another short line. But also comes in handy if you want to attach a swivel or hook to a double line. When you have completed the 6 passes of the swivel or hook pull tight while working the knot down onto the eye of the swivel or hook. The reef-knot is easy tied and will not jam, so it is always easy to untie. This fact makes it a valuable knot to know. To make it more secure the two tag ends can be tied around the main lines or a stopper know can be added. This hitch is one of the easier hitches to tie but has grips better than most. The adjustable grip hitch big advantage though is it gives you ability to slide the knot up and down the main line which will adjust the length of the main line. To make it the Adjustable Grip Hitch easier to untie after being put under a load you can pass a bight (double the rope) through on the last step instead of just passing the tag line through. This give you a easy way to pull the normally single tag line back through. 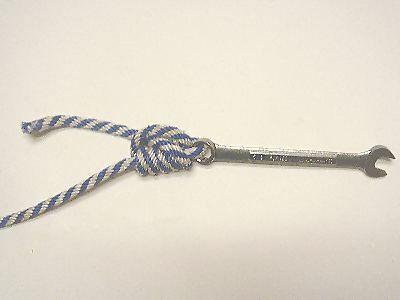 The Surgeon's End Loop is used to forms a loop at the end of rope or fishing line. This end loop is easy to tie and reliable. Great for making leaders, especially for bottom fishing. Quick easy way to coil a rope for storage. Not the neatest but one of the quickest and should be adequate for storing rope on your boat. The Arbor knot is most often used to attach fishing line to a fishing reel!